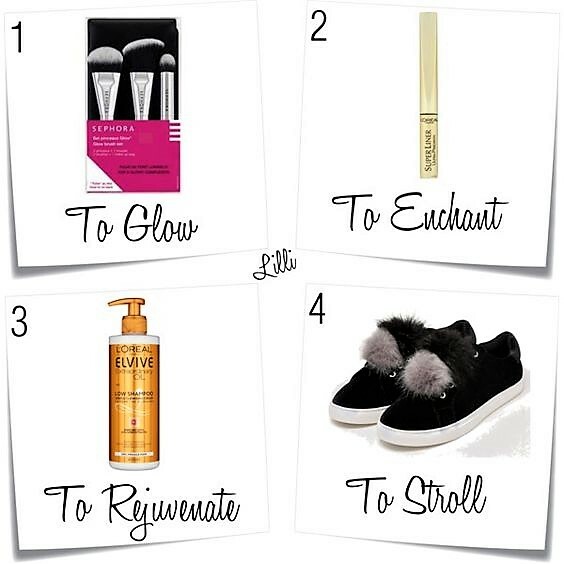 1) SEPHORA Glow Brush Set: the right tools to get the perfect glowy complexion. The set includes three brushes: one for liquid foundation, one for blush and the other one for highlighter. It also contains a little makeup bag and a quick tutorial on how to achieve the strobing trend. The brushes are made up of synthetic bristles, which are super soft and precise. I'm in love with this set, useful and practical; furthermore, it is travel-friendly. 2) L'OREAL PARIS Super Liner Ultra Precision: a great long-lasting liquid eyeliner which is very precise, easy and quick to apply. It is by far the best and I highy recommend it, I purchased it for the third time. 3) L'OREAL PARIS ELVIVE Extraordinary Oil Low Shampoo: the new and fast way to wash dry and damaged hair in just one step. It is absolutely amazing, smells great and doesn't contain sulphates. I must say I am truly impressed and I will continue to use it. Nice picks! The shoes are so cute! Quelle scarpe sono superlative,e i pennelli sono di ottima qualità. I'm currently using a different Loreal eyeliner and I definitely want to try this one next now. You need those pom pom sneakers Lilli :) Happy weekend! These are all fabulous items Lilli. The Glow brush sets are perfect for me and as Christmas gifts to friends. The Pom Pom sneakers are so chic. Have a wonderful weekend. Loreal is amazing!! Sneakers are cute. The brushes look interesting. Will look out for these!